Release Date: 1988 Rule the night! Take the pride of American Stealth technology and take on the best the Warsaw pact technology can offer! Dodge between radars, sneak under enemy fighters, and take out your primary objectives and secondary objectives with your limited weapons onboard, then make your way home. Can you survive all the way to general and win the Congressional Medal of Honor? 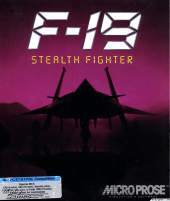 This is based around Sid Meier's closest estimate of the stealth fighter based on the data available at the time. You get full 3D graphics, 3D enemies, random objectives and enemy dispositions (so each mission will be different), dynamic radar effectiveness that depends on your position and radar cross section, enemies that search you out if you do "tickle" their defenses, even civilian aircrafts in the air, and ability to play in cold war, moderate war, or all-out war, with very different rules of engagement.